Reading Andreas Bick’s fascinating technical descriptions of his twin compositions Frost Pattern and Fire Pattern, one could be forgiven for believing these were sound recordings made as part of a scientific research project. In an earlier piece entitled Windscapes (Deutschlandradio Kultur, 2001), he used the natural phenomenon of “singing dunes” – recorded in the Namibian desert. But Klangkunst, the weekly hour-long programme on Deutschlandradio Kultur for which all these pieces were produced, is not about science. It offers plenty to listen to, but there is little talk or explanation. People often ask who is served by scientific research. In this (rare) case, since the composer Andreas Bick uses the results of scientific research, as well as produces recordings under essentially scientific conditions himself, one may answer that science serves art, the art of sound composition. A curious listener scanning Bick’s pieces for the sounds of natural phenomena like “singing flames,” “singing icebergs,” “ice sizzle” or the eruption of volcanoes and geysers, will certainly be fascinated. But such a listener will only hear the skeleton of the composition, not the composition itself (like someone using Messiaen’s Oiseaux exotiques to identify bird calls). Although Bick is sparing in his use of sound-processing techniques, the composition is an “alchemical” process of transformation. As a result, the mighty bass sounds of calving icebergs or volcanic eruptions take on a mythical quality fitting for a work on the primal elements (and primal fears) of humanity. The artistic process here is concerned primarily with making audible the “secret” sounds hidden in nature, liberating the music held in fire and ice. Free download of Dispersion of Sound Waves in Ice Sheets by Andreas Bick – one of the recordings which were used in the composition Frost Pattern. Andreas Bick (andreasbick.de) is grateful to the following for their kind support: Alfred Wegener Institute in Bremerhaven, the company of Fielax, Hanna Hartman, Kain Karawahn, Bastiaan Maris and Andreas Oldörp. Produced by Deutschlandradio Kultur, 2006–2007. First broadcast of Frost Pattern on 3 November 2006 and of Fire Pattern on 8 November 2007. Audio CD and surround-sound version (download only) released by Gruenrekorder (gruenrekorder.de). Awarded the Phonurgia Nova Prize for 2008. Frost Pattern received an honorary mention at the 35th Bourges International Competition for Electroacoustic Music and Sound Art, 2008. Photos of Lake Eyre are part of Murray Frederick’s (murrayfredericks.com.au) Salt series. Pictures on disc and behind tray are based on an ice photo by Heinz Peter Kapteinat. Design by Daniel Knef (knef.code23.de). Translations by Nicholas Grindell (grindell.de). 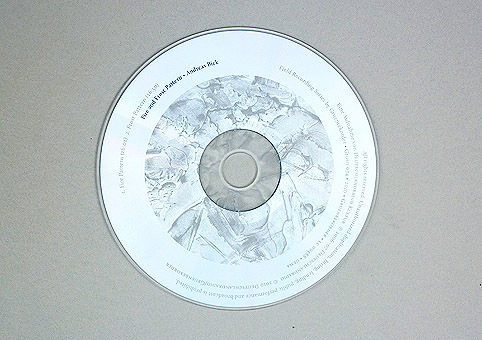 Audio CD released by Gruenrekorder (gruenrekorder.de). With kind support of Deutschlandradio Kultur, Fielax & Alfred Wegener Institute. When he’s not composing music for German film, TV and radio, Berlin-based artist Andreas Bick can be found out and about recording the natural environment. Fire and Frost Pattern collects together two distinctly related works of his field recordings first composed (in 2006 and 2007 respectively) for Klangkunst, a weekly show on Deutschlandradio Kultur dedicated to sound art. Fire Pattern works very much as an exhibition exploiting the sound-producing properties of flames of different sizes found in active volcanoes, on training grounds for airport fireworkers and in small glass tubes and bottles. It begins with the eruptions and thunderous wake of volcanic activity before entering less easily defined territories as dual layers of a grainy drone imitate an aeroplanes engine. This leads on to several vignettes, often preceded by whooshes of ignition that zoom in on the ensuing smaller sounds. Here we find impressions of waves breaking, followed by growing clusters of spit and hiss forming restless complaints, and a giants footsteps perhaps wandering from volcano to volcano to light them like candles. Midway through, tubular putters introduce a gurgling geyser as things get apocalyptic once more before quelling down into the rhythmic interplay of the crackle and hiss of hot embers. The piece ends most remarkably with long, low notes not unlike those of a didgeridoo building into a kind of druidic raga. Frost Pattern also displays the dynamic ranges of a collection of recordings, this time from various bodies of ice. Starting again with the loudest: an iceberg colliding with the Antarctic shelf, the piece plots a path through frozen lakes that mix underwater ambience with surface noise, glacial ice effervescing as it melts in a bathtub, different types of snow falling on aluminium foil and an ice floes thirst-quenching clinks. Once again, these sounds hurtle their blind audience through contrasts of scale, tone and timbre not to describe the corresponding object or event, but to reveal their sonic qualities. In this way, open air destruction on a gargantuan scale builds into climactic cannon fire followed by deep, rich extended tones suggesting an oversize bowed string instrument, before shrinking down to delicate small rustling movements like a series of tiny insects hatching. Later, rising rumbles and thunderous movements introduce what could be sci-fi laser gun shots only to be replaced by more earthly sounds of ripping cracks and low end groans that set in relief the trickle of rivulets or the tap dance of needle-fine dripping. While the sounds presented here are exquisitely preserved and save any listener the danger of braving a volcanos eruptions or an icebergs flow to bathe in their respective soundworlds, the most intriguing aspect is their similarities and differences. Bick has clearly sequenced both pieces to carefully highlight any coincidences: they both begin with the most thunderous events and conclude with smaller, rhythmic passages across an almost identical timeline. However, the clear labelling of each piece combined with amount of detail in the booklet accompanying the disk mean that one is likely to come to these pieces primed as to their significance, perhaps obscuring further similarities from revealing themselves. But this does nothing to stop both pieces from being fine examples of the sensual pleasure that can be drawn from non-musical documentaries of the living world when handled as expertly as Bick does here. I wonder what they sound like when played together? Die Naturgewalten der extremen Temperaturen. Hitze und Kälte. In unseren kulturgeformten Bildern und Begriffen sind sie die Symbolträger des Gegensätzlichen schlechthin. Selten sind wir jedoch in ihrer Nähe. Was wäre, wenn man die Pole einmal nicht nur als Klimawaagschalenhalter des Planeten betrachten würde? Dazu Vulkanismus und Plattentektonik als Voraussetzung für die Entstehung von Leben auf der Erde einfach mal hinter ihren akustischen Eigenschaften zurücktreten lassen könnte? Andreas Bick erarbeitete mit „Fire And Frost Pattern“ im Jahre 2006 im Auftrag des Deutschlandradios Kultur eine klangkünstlerische Arbeit auf der Basis von Natur-Fieldrecordings und anderen Geräuschaufnahmen. Es entstand fast so etwas eine Naturbetrachtung der Extreme unter dem Aspekt der Laute, eine akustische Natur-Phänomenologie als Ergebnis einer klangkünstlerischen Arbeit. Beachtlich sind zwei Aspekte, die „Fire And Frost Pattern“ aus der Vielzahl anderer Fieldrecording-Interessengebiete und -Sammlungen hervorheben. Bick ist sich der besonderen Bedeutung des Parameters der Dynamik bewusst und arbeitet sich an diesem mit den extremsten Lautstärkengegensätzen beginnend (Vulkanausbruch, singende Eisberge) innerhalb der zwei Stücke von ca. 26 Minuten sukzessiv zu den Durchschnitten, mithin in unsere Klang- und Klimatälern hinab. Dabei rekonstruiert und restrukturiert er das Ausgangsmaterial der Feldaufnahmen auf eine ebenso behutsame wie durch und durch musikalische Art und Weise mit den Mitteln der Konfrontation, Staffelung und Überlagerung. Eine von Anfang bis Ende brilliante Arbeit, die in ihren Ergebnissen an manchen Stellen überraschenderweise gar nicht so weit entfernt zu sein scheint von den zumindest teilsynthetischen Welten eines Asmus Tietchens. 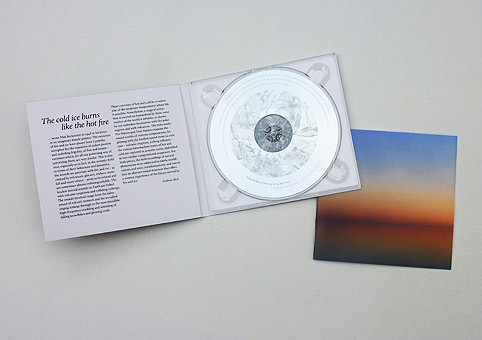 Andreas Bick offers the furthest extremes of heat and cold which the natural world can throw at him on Fire and Frost Pattern (GRUENREKORDER GRUEN 074), two suites composed from sound events created by geysers, volcanoes, colliding icebergs, ice buckling, snow falling on foil, and so forth. Both works are structured to begin with the loudest sonic element in his hard drive (the volcanic eruption wins hands down for the Fire piece), and then proceed to direct the listener through an astonishing journey, where we experience these wild and raw forms of nature from a comparatively safe and privileged vantage point. The listening experience still conveys some sense of danger even so, and also tells us how little we still understand or really know about the planet. Somewhere in the liner notes one can read that the ‘artistic process is primarily concerned with making audible the ‘secret’ sounds hidden in nature’ and that very well can be read as the mission of Germany’s Gruenrekorder label in general. Fire, water, earth and air were the 4 elements identified by the ancient Greeks as a first attempt to describe and explain matter surrounding us. As this could not explain everything, alchemists added aether as a fifth element to help their quest for wealth. In this continued search, Bick almost creates a master’s thesis, based on a lot of field work. And imagining how that field work must have looked like, an underwater laboratory comes into mind, with specialized instruments able to register micro-tectonic rumblings, that are normally impossible to hear by human beings. Most of the things that are going on are hardly above normal audible levels as these are microtonal structures, found on a journey through fire and ice, with much patience and a greatly developed sense for details. Most of the sound phenomena on the two tracks (one is called Fire Pattern and the other is Frost Pattern) find their basis in ordinary physics, like air vibrating inside glass tubes heated by a gas flame, the sound of alcohol igniting inside flasks or field recordings in the vicinity of a volcano creating contrast with sound waves moving through ice and the sound of snowflakes as they fall and touch the ground. The effect that these patterns have, are similar with experiences in late night mist, when things can unexpectedly show up, more nearby than assumed, disturbing an isolationist feeling. Fire and Frost Pattern should be played only at very high levels to have those droning sonic sculptures appearing as if they were hidden and their latent present shape sublimates as soon as we hear them. Yet, with all its details, patience and academic approach there is a analogy with all alchemists attempts up to now at least; Bick is not able to transform simple matter into gold. PvdG. Two long tracks of re-contextualised field recordings of heat and of cold. Bick has amassed a collection of sounds that represent the many variations on each of these themes and created two long selections of harsh yet immersive soundscapes. In terms of vision and execution Bick’s work puts me most in mind of the later period works of Japanese sound ‚designer‘ (his term) Akifumi Nakajima (Aube) who’s single sound-source compositions tread similar ground to Bick. The discordant sound sources melding to provide an anomalously restful and multi-hued whole. Bick’s choice of sources is an inspired choice. Adapting them from a range of sources from both the sciences and the arts he has created an alchemical fusion of the two into something new and rather special. Blasting volcanoes and colliding icebergs: Relating sounds to temperature. Fire and Frost Pattern, by German composer and sound artist Andreas Bick, is an exploration of sounds generated by heat and cold temperatures. The album consists of two pieces of nearly identical length, each constructed entirely of natural sounds related to temperature. Field recordings of geysers, volcanoes, icebergs, snow, fire, and cracking ice are used to create shifting rhythms and held tones that coalesce from seemingly random sounds to coherent “musical” ideas. Both “Fire Pattern” and “Frost Pattern” begin with the loudest sonic event related to that temperature extreme (a volcanic eruption; an iceberg collision) before documenting movement to a more moderate temperature. Sounds generated by such events as a smoldering fire, water droplets evaporating, and ice melting create fascinating rhythmic regularities and irregularities. Long, glissing bass tones are the result of sound waves dispersed through ice sheets. The dripping of water and crackling of ice make for a meditative soundfield transformed by “active listening” to soothing rhythmic grids. The other intriguing conceptual realization inspired by Fire and Frost Pattern is the uncanny similarity of sounds generated by extreme heat and extreme cold. Bick uses a nearly identical form in both pieces to illuminate this point. The blasting volcanic eruption that opens “Fire Pattern”—the loudest “heat-based” sound on earth—sounds remarkably similar to the iceberg collision that opens “Frost Pattern.” In each piece, the opening sound is immediately contrasted with an extremely quiet temperature-based sonic event (evaporation of water, falling snow). From there the pieces move through the rhythmic resonances of what sound like flames flaring, snow crunching, wood crackling, water sizzling on a pan, steam, and countless other indistinguishable sounds. Bick manipulates the sonic textures into churning, inconsistent rhythms broken by textural changes and barely audible “drones” of found sounds. The compositions move through their respective “heating” and “cooling” processes, illustrating a decrease of kinetic energy, before settling on long tones. Throughout, Fire and Frost Pattern is a fascinating work that magnifies and illuminates the intricacies of sonic events largely unexamined by human ears. At moments the pieces truly transcend the concept of “field recordings” and “sound art” to make a truly unique sensory experience. Klangkunst die sich mit Naturphänomenen befasst hat oft die gleiche Wirkung auf uns wie seinerzeit frühe Tierfilme im TV. Man taucht ein in unbekannte Welten, erhält plötzlich Zugang zu bisher verschlossenem Terrain. Wenn dieses “Aufdecken” und “Hineinführen” mit einer eigenen ästhetischen Qualität, die über das bloße Entdeckertum hinausreicht, vollzogen wird, dann entsteht tolle akustische Kunst. Andreas Bick ist dies mit seinen beiden für das DeutschlandRadio Kultur produzierten Stücken Fire Pattern und Frost Pattern bestens gelungen. Ein Stück erforscht die Eigenschaften von Vulkanen und heißen Quellen, der Gegenpart geht den Eisbergen und Frostblumen auf den Grund. Bick geht im Text auf einige Aspekte der Klangforschung ein, die ihn besonders aus kompositorischer Sicht reizten. Und da geht mir ein Stoßseufzer auf: denn auch wenn das Grummeln der Hitze brutal harsch klingt, das Bewegen des Eisbergs wie ein röhrender Löwe oder das langsame Schmelzen wie ein Glitch-Remix von Autechre, so sollen diese Klänge mich bitteschön um ihrer selbst Willen fesseln. “Boah!” will ich nicht sagen müssen, weil mich Bick überrascht, wie toll ein Eisberg klingt, z.T. erst mit technischen Hilfsmitteln hörbar gemacht. Hier ziehe ich die naiv-emphatisch Geste eines Rolf Julius vor, der eine Membran auf einen Stein legt. “Boah!” sage ich, weil Andreas Bick mit abenteuerlichen Klängen wie selbstverständlich operiert und sie miteinander als “Musik” wirken lässt. Gegen alle lackaffigen Tendenzen so mancher Klangkunst lässt sich Andreas Bick immer von der Faszination für den Sound leiten. Dafür bin ich ihm dankbar und ich meine, diese Faszination hört man seinen beiden Kompositionen auch an. No metaphor – even in the art world, with its more experimental and avant-garde latitudes – exceeds the immediate fascination that the hot-cold dualism manages to evoke. The extremes – as Eastern philosophy teaches us – are to some extent complementary; they transform into each other, are interdependent and have a mutual origin. Especially in the field of acoustics, the auditory phenomena associated with fire and ice exhibit strange behaviors and very similar frequency dynamics: the field recordings that stem from them are almost indistinguishable. Erupting volcanoes and colliding icebergs – even though vastly different processes – seem to refer to the same world of sounds. These limits demarcate the „middle zone“ of the audible. In both of the two long suites in this project by Andreas Bick, the materials extracted in the field have undergone only subtle changes and transformations, woven into an abstract structure that offers a truly intense sensory experience of the forces exerted. Nessuna metafora – anche nel mondo dell’arte e alle sue latitudini maggiormente sperimentali e avanguardiste – supera per le immediate suggestioni che riesce ad evocare, quella dettata dall’opposizione caldo-freddo. Gli estremi – come ci insegna anche la filosofia orientale – sono però in qualche misura complementari, si trasformano l’uno nell’altro, sono interdipendenti e hanno origine reciproca. In ambito acustico soprattutto, i fenomeni auditivi che è possibile associare con il fuoco e con il ghiaccio, hanno stranamente un comportamento e dinamiche di frequenze molto simili: le field recording che ne scaturiscono risultano infine quasi indistinguibili per provenienza. Vulcani in eruzione e iceberg che collidono – pur nei loro differenti processi – sembrano far riferimento ad un medesimo universo sonoro, limiti che stanno poi a demarcare quella che è la „zona intermedia“ dell’udibile. In entrambe le due lunghe suite di questo progetto di Andreas Bick, i materiali estratti sul campo sono stati sottoposti solo a sottili modifiche e trasformazioni, intrecciati in una struttura astratta che offre davvero un’intensa esperienza sensoriale delle forze esercitate. Home very late tonight, midnight in fact after spending the evening eating a rather nice meal cooked by my better half. I have committed to writing a review every day for a little while though, so I will do just that. I spent the day listening at various times to Fire and Frost pattern, a CD by Andreas Bick released quite recently on the Gruenrekorder label. This is one of those CDs which I don’t get my hopes up too high for before listening, for probably quite irrational reasons. Firstly, I really don’t like the sleeve design one little bit, but that’s a taste thing. Then I note from the back sleeve that the music has been entered, and subsequently won several “sound art” prizes. This is certainly not a good sign! Then, reading the extensive liner notes, the music is made to sound as much like an audio equivalent of a National Geographic article than simply some interesting music. Details are given about where each sound on the two pieces here were found and how they were recorded. probably a little too many details really. There are two pieces here then, each lasting around the twenty-six minute mark. Named Fire Pattern and Frost Pattern, the two are derived from sounds involving the two extremes of temperature. The Fire track utilises recordings of volcanoes, geyser activity, and ignited alcohol vapour alongside some kind of ‘gas burning in a test-tube’ activity. The sounds are then collaged together to create the piece. Similarly, Frost Pattern uses seismic recordings of iceberg induced earthquakes, cracking ice, “sizzling” ice and apparently the sound of snowflakes falling onto a sheet of aluminium foil hooked up to contact mics. The question then, given that we have a wild array of unusual and nicely recorded sounds here, is does all of this come together to make convincing music or are these sounds best considered as some kind of science experiment? Well its patchy, but often it is possible to forget the origin of the sounds and let the musicality of the compositions work. The Frost track, the second here is decidedly more interesting than Fire Pattern, perhaps because the sound of cracking, straining and hissing ice is that much more detailed and a wider range of sounds appear than in the rushing, heaving explosions that exist in the Fire track. They are also somehow more musical sounds. Although the semi-regular explosive elements of the volcanic eruptions in the first piece form a kind of structure and rhythm that the groans and hisses of the other fiery elements work well with, the Frost track feels more like the music I normally listen to, more textural and grainy, a mix of little shards of prickly sound and larger, booming groans. This isn’t a bad CD at all then, its listenable and in places the detail and sheer incredibility of the sounds made by nature and man’s intervention with it are fantastic. There is an air of art establishment to it all though that comes through in the music here and there as the composition does feel a little tame, sounds placed almost politely beside each other rather than really brought together with a bang to see what occurs. Beyond the probable dangers of trying to record gas flames trapped in glass bottles etc, It doesn’t feel all that risky music, and its origins as a presentation on a German cultural radio station, together with all those sound art awards do seem to get in the way of my enjoyment as the music feels more like a series of neatly arranged science experiments presented as music rather than anything more raw and sensual. Still, an interesting and on occasion quite awe-inspiring set of recordings that will be of interest to those interested in the documentation of natural phenomena as much as anyone into experimental music. This German composer and sound artist based in Berlin has been working in a wide range of fields like rock, hip-hop, music for films, TV series, radio play soundtracks, dance theatre and writings, among others. This record belongs to the field recording series of German Gruenrekorder label which is run by German sound artist Lasse-Marc Riek. 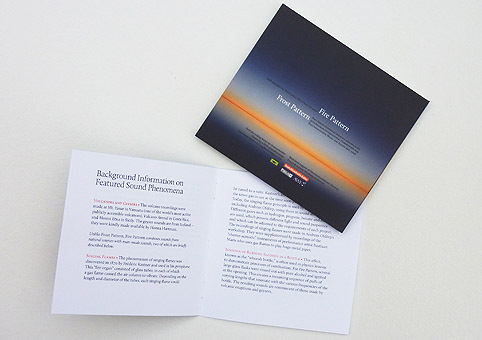 The CD consist in two pieces: “Fire Pattern” and “Frost Pattern” recorded in 2006 and 2007, respectively and is accompanied by a booklet with Bick’s descriptions of the sound sources which are warm phenomenons like natural sounds from volcanoes, geysers and man-made sounds that can be listen on “Singing Flames” (gas flames into a glass tubes produce a specific notes) and “Ignition of Burning Alcohol in a Bottle” (sound produce when it ignites the alcohol into a glass of water which is similar to the one volcanic eruptions and geysers make). The cold sounds phenomenons were recorded on “Singing Icebergs” which is about ice collisions, “Dispersion of Sound Waves in Ice Sheets” register the sound of the ice expanding and contracting by the fluctuations in temperature that finally produce cracks; “Ice Sizzle” that records how the ice melts in the sea; “bubbles of air create an explosive popping noise, adding up to a many-voices sizzling”. “Snow on Aluminium Foil” is the sound of falling snow that can show different sonorities. “Creaking and Cracking Ice” and “Ice Buckles” are the last two recordings about ice in different conditions. I would say that most of the sounds I heard make me feel scare and maybe this is because I do a parallel to the sounds of shakings and earthwakes that unfortunately in Chile we are used to them. Este compositor y artista sonoro alemán reside en Berlín en donde ha estado trabajando en distintos campos como el rock, hip-hop, música de películas, series de TV, bandas sonoras para radio, danza teatral y ensayos entre otros. Este disco pertenece a la serie de grabaciones de campo del sello alemán Gruenrekorder dirigido por el artista sonoro alemán Lasse-Marc Riek. El CD consiste en dos temas: “Fire Pattern” and “Frost Pattern” grabados en 2006 y 2007, respectivamente y que contiene un folleto con las descripciones que Bick hace de las fuentes sonoras que son fenómenos naturales que emiten mucho calor como volcanes y géiseres, además de sonidos hechos por el hombre que pueden ser escuchados en los temas “Singing Flames” (llamas de fuego que dentro de un tubo de gas producen notas específicas) e “Ignition of Burning Alcohol in a Bottle” (sonidos que se producen cuando se enciende fuego al alcohol dentro de una botella de vidrio, que son similares a los que realizan las erupciones de volcanes y géiseres). Los sonidos del frío extremo fueron grabados en “Singing Icebergs” y se trata de colisiones de hielos; “Dispersion of Sound Waves in Ice Sheets” registra el sonido del hielo cuando se expande y contrae producto de los cambios de temperatura y que finalmente producen grietas; “Ice Sizzle” graba el hielo cuando se derrite en el mar y “burbujas de aire crean un estruendo, agregando muchos chirridos. “Snow on Aluminium Foil” es el sonido de la nieve cayendo sobre el agua que puede mostrar varias sonoridades. “Creaking and Cracking Ice” y “Ice Buckles” son las últimas dos grabaciones acerca del hielo en sus distintas condiciones. Diría que la mayor parte de sonidos me producen miedo y quizás esto se deba a que hago un paralelo a los ruidos que producen los temblores y terremotos, a los que desafortunadamente aquí en Chile no estamos ausentes. 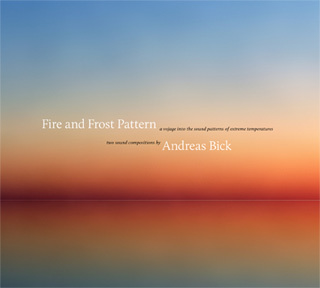 Andreas Bick is a German composer and sound recording artist for radio, theatre, film and television.Fire and Frost Pattern is released as a stereo recorded CD or as a surround sound download. It was awarded the Phonurgia-Nova-Prize in 2008 and a mention at the 35th International Competition of Electroacoustic Music and Sonic Art in Bourges 2008. Fire and Frost Pattern negotiates the ground between environmental sound recording art and composition. It is never at any time either explicitly and compositions of recordings are directed at questions such as: how do you record falling snow? How do you make flames sing? The techniques for such recordings are documented by Bick in the accompanying booklet and the experimental compositions are arranged with sound recordings from active volcanoes Mt. Yasur in Vanuatu, Vulcano Arenal in Costa Rica, and Mount Etna in Sicily. Similarly geyser sounds from Iceland are combined with ‘singing icebergs’, ‘dispersion of sound waves in Ice sheets’, ‘Ice sizzle’, ‘Creaking and Cracking Ice’ and ‘Ice Buckles’. Bick points to the technical difficulties in transposing sounds of ice from infrasound to an audible range and the difficulties associated with such transposition. Among other technical issues explored include the loud 205db source sound of the collision of icebergs, the incidental sounds of seals, the whoosh bottle effect of the ignition of alcohol and gas flames creating vibrating columns of air..
An important aspect of the release is the attempt to convey an unromantic depiction of nature, to steer clear of the passionate, metaphoric or allegoric renderings of nature. The difficulty in creating a piece where construction of sound merges with recording of sound encounters the problem of how constructions can covey objective information. That it could be objectively related to the listener outside frames that had no conditioning is no longer really a serious proposition, but to steer clear of overt entanglements with concepts associated with the perception of nature in the construction is more the goal of the recording. While it is impossible to avoid the sense of the compositional Bick notes that a good deal of such activity happens at the micro level imperceptible to the listener. In a more direct sense they are two tracks that are specifically renderings of fire and ice, renderings into patterns. They are collated into two tracks that mix constructed sounds of these natural phenomena with recorded sounds, in no sense is to be conceived as a scientific rendering but more product of scientific investigation and documentation into a descriptive work forged from numerous source inputs. Despite the polarities associated with fire and ice, the sounds that emerge during this recording’s two pieces are such that at times they could as easily respresent one as much as the other (a trudging rhythm that emerges in “Fire Pattern” could pass for someone trudging through snow, for example). In accompanying liner notes, Andreas Bick makes the same point in acknowledging that the sounds associated with the two elements—the loudest ones linked to volcanic eruptions and colliding icebergs—are sometimes indistinguishable. In the recording’s two twenty-six-minute pieces, the Marl, Germany-born sound artist, known for writing music for films and radio plays, explores the full spectrum of sounds associated with the elements, from the loudest (eruptions and tremors) to the softest (the almost inaudible noises made by snowflakes and coals). Though some degree of modification was applied to the raw material, the integrity of the originating sounds is preserved in the recordings. “Fire Pattern” opens with the repeated sound of a volcanic eruption that’s as fierce as a granite structure collapsing or an amplified wave crashing. That initial episode is followed by skittering figures that suggest fire igniting, and as the piece continues, convulsions and crackling appear, often woven together so that alternating contrasts of loud and soft emerge. Near the end, a deep, guttural drone appears that, strangely enough, sounds as much like Tuvan throat singing as it does anything fire-related. Like the first piece, “Frost Pattern” opens with violent sounds, in this case stemming from an iceberg collision, after which oscillating pitches of creaks, crackles, and groans surface. At certain moments, dribbling sounds identify the source material as water-related, but at other times the sounds assume a more elusive quality that makes them sound less associative though still elemental. What’s especially impressive is how Bick takes such natural sounds and sequences them into field recording compositions, as opposed to merely presenting them as unrelated streams of varying sounds. As a result, one hears the two pieces as compositions of an unusual sort that are in some strange way suggestive of classical form in their structural design. Equally fascinating are Bick’s detailed descriptions (in the booklet that comes with the recording) where he writes about “singing flames” (within glass tubes, gas flames are tuned to specific notes), “ice sizzle” (as glacial ice melts in the sea, bubbles of air create an explosive popping noise that becomes a multi-voiced sizzle), and the crackle of snowflakes and the creak of cracking ice. Ultimately, the two pieces on this fascinating recording unlock some of the sonic mysteries of the earth’s primal elements by granting such an up-close perspective, and they also serve as a reminder of their indomitable status. As advertised, two compositions, one based in flames, one in ice. A variety of sound sources are employed, from field recordings (volcanoes, cracking lake ice, iceberg „sizzles“) to what might be thought of as science lab phenomena (gas flame sin glass tubes, ignited alcohol in a bottle, snow falling on aluminum foil). The pieces are clearly assembled and strike me as having something of the character of your standard magnetic tape works of the 60s, i.e., more concerned with contrast between blocks of sound, timbre and texture than structure (I’m certainly being unfair both to those older composers and, likely, Bick). This can make for intriguing listening on one level but I come away, ultimately, unsated. I need more mystery, maybe. Огонь и лёд…идеальные объекты для философских метафор и размышлений на тему несовместимых вещей, соединение которых может породить взрыв и мгновенное разрушение. Если они и соединяются, то только с помощью таких людей, как Андреас Бик, который собрал из звуков, порождаемых огнем и холодом две продолжительные композиции, удостоенные наград на фестивалях электроакустической и экспериментальной музыки. Огонь – какие звуки порождает он? Пламя костра, треск углей, шёпот выходящего из зажигалки и воспламеняющегося газа? И это в том числе, но Бик окинул окружающий мир более широким и «незамыленным» взглядом, и нашел множество способов получить уникальные, ни на что не похожие звуки. Извергающиеся вулканы и гейзеры демонстрируют свою мощь, загадочно и абсурдно звучит «огненный орган», пламя горит внутри бутылки и на поверхности фольги – и все это аккуратно записывается, полученные звуки проходят обработку, усиливаются и становятся неотъемлемой частью пьесы, звучание которой варьируется от динамичных моментов, во время которых огонь демонстрирует свою «подвижную» природу и даже задает мельчайшими фрагментами шумов некий абстрактный ритм, до статичного, масштабного гула. Es ist wieder soweit: Der Winter hat Deutschland fest im Griff, draußen herrschen wenig einladende Minusgrade. Genau die richtige Zeit also, um es sich vor der heimischen Anlage mit field recordings von extremen Temperaturen gemütlich zu machen – so wie Tina Manske. Der Komponist und Klangkünstler Andreas Bick hat sich in den letzten Jahren unter anderem als Komponist von Fernsehmusiken (“Berlin Berlin”, “Der Dicke” et al.) hervorgetan. Mit seiner neuesten Veröffentlichung wagt er sich an die Grenzen der bewohnbaren Welt. Die Temperaturen, die man hier ‘hört’, sind zu extrem, um darin leben zu können, und dennoch (oder gerade deswegen) strahlen sie eine ungeheure Kraft aus. ‘Patterns’, Muster kennen wir im Fall von Hitze und Kälte insbesondere auf der visuellen Ebene (das Muster, das sich auf der schlecht isolierten Fensterscheibe nach einer kalten Nacht zeigt oder das Flirren der Luft über einer heißen Straße). Muster gibt es aber auch auf der auditiven Ebene. In den Liner Notes macht Andreas Bick auf den ewigen Dualismus zwischen brennendem Feuer und klirrender Kälte aufmerksam. Interessanterweise aber sind sich beide Phänomene in der Form ihres Klanges sehr ähnlich, manchmal sogar überhaupt nicht zu unterscheiden. Der Ausbruch eines Vulkans und das Zusammenstürzen eines Eisbergs haben eine identische Soundstruktur, das Knirschen von gefrorenem Wasser unter leichtem Druck ähnelt plötzlich dem Knistern eines Holzscheits im Kamin. Die beiden zusammengehörenden Kompositionen aus Feldaufnahmen entstanden für das Deutschlandradio Kultur und wurden dort zum ersten Mal 2006 und 2007 ausgestrahlt. Im Jahr 2008 erhielten sie den Prix Phonurgia Nova, eine Auszeichnung für herausragende Klanginstallationen und -projekte. Jetzt sind “Fire Pattern” und “Frost Pattern” beim auf Feldaufnahmen spezialisierten Label Gruenrekorder auch auf CD erschienen. Für die Kompositionen wurden Feldaufnahmen mit elektronischen Hilfsmitteln leichten Transformationen unterzogen. Bick gelingt es, auf künstlerischem Weg die in Feuer und Eis enthaltene ‘Musik’ hörbar zu machen. Unter den Phänomenen, die man hier zu Gehör bekommt, finden sich singende Eisberge (eingeschlossenes Wasser, das mit Hochdruck durch Hohlräume gedrückt wird, erzeugt Oszillation und damit die singenden Töne), singende Flammen (ein Phänomen, das bereits im 19. Jahrhundert von Frédéric Kastner entdeckt wurde), die Geräusche, die Berliner Seen während Temperaturveränderungen in den frühen Morgen- und späten Abendstunden von sich geben und das Entzünden von Alkohol in Flakons. Den Fall von Schnee hörbar zu machen, dürfte zum Schwersten gehören, dessen man sich als Klangkünstler annehmen kann. Bick gelingt das Kunstwerk, indem er die Kristalle auf Alufolie fallen lässt, die wiederum direkt an ein Mikrofon angeschlossen ist. Der einzige Sound auf der CD, der nicht von den Elementen selbst herrührt, ist der leise Ruf einer Robbe von unter dem Eis. Romantisch. My big problem with For ‘Fire And Frost Pattern’ is that it skates dangerously near to ‘new age’. Its two compositions of ‘fire’ and ‘frost’ remind me of the days when doped up hippies used to sit and listen to whale sounds going yeah man and wheres the bean casserole. Andreas Bick creates two almost thirty minute pieces, one representing heat and the other cold. As you can probably guess Fire Pattern contains the sounds of volcanoes but after that struggles a bit so includes the man made sounds of ‘singing flames’ [a kind of late 19th century flame organ] and alcohol burning in bottles. Its OK but not a patch on Frost Pattern which has far more depth to it. I was lucky enough a few years back to experience one of the sounds included here; whilst walking around the edge of a lake in Sweden one morning I heard a high pitched sound followed by a low rumbling one. It turned out to be the air escaping from beneath the ice. The entire lake was frozen over, but was slowly melting. Maybe a mile in diameter and the entire piece of ice was floating, air escaping to its edges in small spurts. On a cold, still morning with no one around it was an experience I’ll never forget and one I’m grateful to Bick to be able experience again. Ice, snow, frost, cleaving icebergs, Bick uses them all to good effect and incredible sounds they make too. Capturing the sound of falling snow flakes by attaching contact mics to sheets of tin foil also works. If only I could shake off this new age thing maybe I could like it just that little bit more. I’d have been quite happy to have listened to all of these sounds as individual tracks. Collaging them into ‘suites’ or ‘symphonies’ or ‘patterns’ leaves me um … cold.